Peter Chrysologus, (Peter the “golden-worded”) (c. 380 – c. 450) was Bishop of Ravenna from about AD 433 until his death. He was declared a Doctor of the Church by Pope Benedict XIII in 1729. Peter was born in Imola in northern Italy, where he was ordained a deacon by Cornelius, Bishop of Imola. He was made an archdeacon through the influence of Emperor Valentinian III. Pope Sixtus III appointed Peter to the See of Ravenna in about the year 433, apparently rejecting the candidate elected by the people of the city. The traditional account, as recorded in the Roman Breviary, is that Sixtus had a vision of St. Peter and St. Apollinaris, the first bishops of Rome and Ravenna respectively, who showed Sixtus a young man and said he was the next Bishop of Ravenna. When the group from Ravenna arrived, including Cornelius and his archdeacon Peter from Imola, Sixtus recognized Peter as the young man in his vision and consecrated him as a bishop. Known as The Doctor of Homilies, Peter was known for his short but inspired talks; he is said to have been afraid of boring his audience. After hearing his first homily as bishop, Empress Galla Placidia is said to have given him the surname Chrysologus, by which he is known. Galla Placidia was to become the patroness of many of Peter’s projects. Peter spoke against the Arian and Monophysite teachings, condemning them as heresies, and explained topics such as the Apostles’ Creed, John the Baptist, the Blessed Virgin Mary, and the mystery of the Incarnation, in simple and clear language. Peter advocated daily reception of Holy Communion. He urged his listeners to have confidence in the forgiveness offered through Christ. He was a counselor of Pope Leo I. The monophysite, Eutyches, appealed to Peter to intervene with the Pope on his behalf after he was denounced at a synod held in Constantinople in 448. The text of Peter’s letter in response to Eutyches has been preserved in the Acts of the Council of Chalcedon; in it, Peter admonishes Eutyches to accept the ruling of the synod and to give obedience to the Bishop of Rome as the successor of Saint Peter. St Peter died in the year 450 or later, when on a visit to his birthplace. Older reference books say he died on December 2, but a more recent interpretation of the ninth-century “Liber Pontificalis Ecclesiae Ravennatis” indicated that he died on July 31. When in 1729 he was declared a Doctor of the Church, his feast day, which was not included in the Tridentine Calendar, was inserted in the Roman Catholic calendar of saints for celebration on December 4. In 1969 his feast was moved to July 30, as close as possible to the day of his death, July 31, which is occupied by the feast day of Saint Ignatius of Loyola. 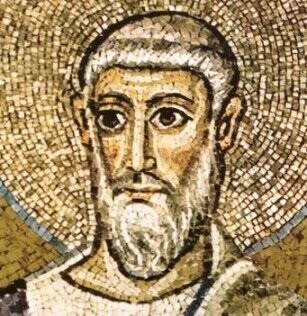 A contemporary portrait of St Peter Chrysologus is found in the mosaics of the Church of San Giovanni Evangelista in Ravenna, where he is depicted among the members of the eastern and western imperial family, showing his extraordinary influence.